Don't Let Your Holidays Go Up In Smoke! Dispose of your tree immediately after the holiday! Thirty seconds is all it takes for a dry Christmas tree to be consumed by fire. Each year, Christmas trees cause over 100 fires nationally, resulting in death, injuries and millions of dollars in property damage. Many people will leave their trees up through the New Year — but fire doesn't take a holiday. The Cedar Hill Fire Department urges everyone to remove the trees to avoid a tragedy. The first rule of tree disposal: Never put the tree or branches in a fireplace or wood burning stove! The fire could extend beyond the fireplace or stove and leave your home in ashes. 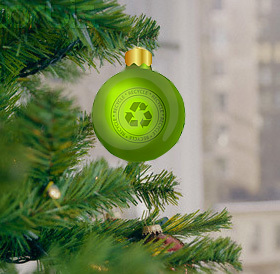 Start out the New Year right by recycling your Christmas tree! Don't send your Christmas tree to the landfill, instead you can recycle it and give a gift back to the earth.